Carsen Twarynski knew he had to earn a contract from the Philadelphia Flyers. They weren’t just going to give it to him and there were no guarantees from the outset of his over-age season in the Western Hockey League. If not signed by June 1, the 20-year-old power forward — and third-round pick (82nd overall) from 2016 — would have re-entered this year’s NHL draft. With the clock ticking in that direction, Twarynski finally put pen to paper on a three-year entry-level deal on March 11. “It was definitely very exciting for all of us,” added Twarynski, who was surrounded by family members — his parents, Rob and Kim, and older brother, Brayden — for the occasion. “It’s special, it’s something that you’re never going to be able to experience again. Equal parts thrilled and relieved to get that deal done, Twarynski can shift his focus to Kelowna’s first-round playoff series against the Tri-City Americans, starting at home on Thursday and Saturday. 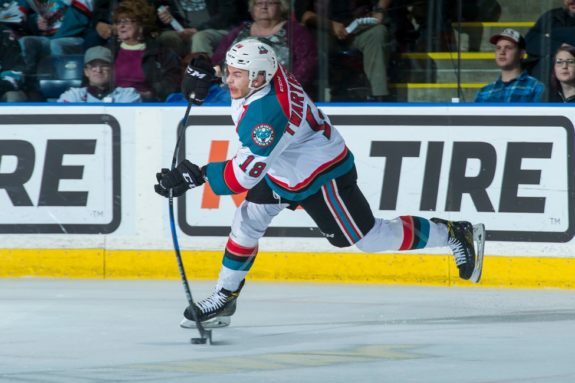 Sure, there was some uncertainty and a bit of anxiety — especially in the early stages of the season, when Twarynski returned to junior from Philadelphia’s training camps empty-handed — but he did his part in leading the Kelowna Rockets in goals, with 45. Carsen Twarynski of the Kelowna Rockets leans into a shot during last year’s WHL playoffs. That eye-popping total ranked ninth among WHL leaders, and as that number increased, so did Twarynski’s chances of signing with the Flyers. 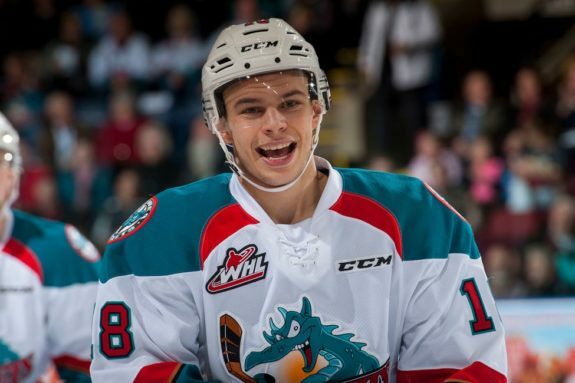 His body of work, which also included a team-high 18 power-play goals (tied for third most in the league), warranted the opportunities that now await Twarynski in pro hockey, beginning in the fall or perhaps this spring following Kelowna’s playoff run. Twarynski was able to block out the distraction of that looming deadline and contract negotiations for the most part but, at times, the struggle was real. “With how I was playing, I was confident, but my agent (Kevin Epp with Titan Sports Management) helped me out a lot,” Twarynski said. “He told me at the start to not really think about anything until around March, when it did happen. He said just worry about playing my game and do what they asked, and go produce and be confident. As for those trying times, Twarynski admitted it can be a mental battle in feeling the constant pressure to perform. “There were just a few times, if I had a good stretch, I’d be wondering. Or if another team might have signed another guy, it kind of plays with your head a little bit,” he said. “That didn’t stop me from doing what I had to do every night. I just turned the switch off and went and prepared for my next game. Now that weight is off Twarynski’s shoulders, prior to playoffs, even if it wasn’t weighing him down on a daily basis. It did fuel him with motivation, and Twarynski turned into a consistent force for Kelowna as the regular season progressed. “Any time you’re in a situation where you’re trying to make an impression with a team and earn a contract, or some guys are trying to earn a tryout, you can put extra pressure on yourself. Some guys struggle with it because they mentally play the game before the game’s played, but he’s done a good job of not putting that at the forefront,” said Rockets head coach Jason Smith, who played parts of 15 seasons in the NHL, captaining the Edmonton Oilers to the 2006 Stanley Cup Final and spending his second-to-last season with Philadelphia before retiring in 2009. Jason Smith knows a good pro when he sees one, having been a leader at the highest level around the turn of the century. His insights will prove invaluable for Twarnyski as he makes the jump from junior to the Flyers’ organization. That’s a ringing endorsement from Smith, who has utilized Twarynski in all situations as one of his more trusted players this season. 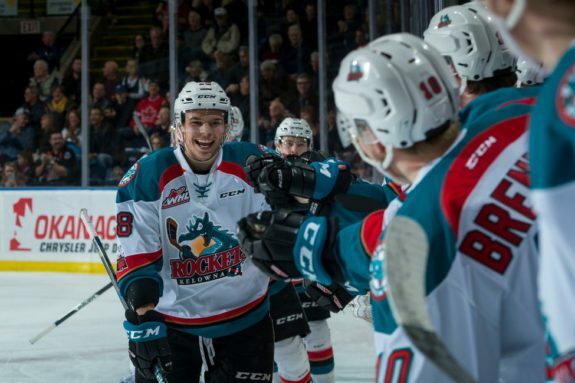 Granted, he was an older player, but Twarynski had to earn that trust in his first full campaign with Kelowna, having been acquired from his hometown Calgary Hitmen at last year’s trade deadline (on Jan. 8, 2017) in a 1-for-1 swap for Jake Kryski that worked out well for the Rockets. “You go through a learning curve when you get traded and you maybe don’t have some early success, but he’s been coachable, he takes direction, and he wants to be a player,” Smith said. The Flyers were keeping close tabs on that transition and how Twarynski’s role was evolving in Kelowna. Some felt it was a 50-50 scenario coming into this season as to whether Twarynski would be signed by Philadelphia. “Any conversations we’ve had throughout the year with the guys from the Flyers, they asked about his progression and his work ethic, and obviously you see the results on the scoresheet,” Smith said. “It’s not like they weren’t here watching him and aware of him. They have had player development guys out here and they have scouts here that are watching draft-eligible guys, so they are putting in reports all the time. He obviously made the impression by doing things the right way. Twarynski made big strides this season, as evidenced by his stat-line — finishing with 72 points, including the aforementioned 45 goals, in 68 games. Those were both career highs and Twarynski more than doubled his previous best of 20 goals from his draft year as a sophomore in 2015-16. He only managed 17 goals over 64 games last season, split between Calgary and Kelowna. Twarynski’s bounce-back effort also earned him Most Improved Player at Kelowna’s annual awards banquet on Sunday, and he shared Humanitarian of the Year honours with over-age defenceman Gordie Ballhorn as well, which speaks to Twarynski’s character off the ice and away from the rink in the community. “His leadership in the room and his work ethic have allowed him to have success. He’s wanted to be put in situations where he’s challenged and he’s embraced that, and he competes,” Smith said. “He’s obviously had a big year and he’s contributed not just by scoring goals, but he’s been really good on the power play moving the puck and good on the penalty kill. His game took a step forward this year, from where he was last year, by the work he put in. “Getting the chance to go back to pro camp again (this past fall) and really seeing the work that it takes and how hard you have to push yourself to get to that next level, he made some adjustments in what he was doing and he’s moved forward,” Smith added. There have been several reasons for Twarynski’s on-ice breakout, especially in the goal-scoring department. Improved accuracy might be the biggest factor, according to Smith. “Last year we saw glimpses of him being able to shoot the puck. A big thing this year, for him, is hitting the net,” Smith said. “That’s something that young players learn — you can have lots of shots, but if you’re missing the net, it doesn’t count. Getting the puck on the net and forcing the goalie to make a save is very important. And, for him, getting to the net. Twarynski has always possessed an above-average shot, but he hasn’t always been a volume shooter. He developed a shoot-first mentality this season at the advice of a former coach and mentor in Grant Point — the father of Tampa Bay Lightning budding star and former WHL standout Brayden Point, who coached them as teammates back in peewee. “He gave me some statistics to shoot for this year, and told me to aim for at least four shots a game,” Twarynski said. “I’ve done that and it’s worked out to how he told me it would. Carsen Twarynski has had plenty to smile about this season. Interviewed prior to Kelowna’s season opener, Twarynski sounded cautiously optimistic but didn’t want to throw out any numbers to avoid setting the bar too high for himself. Afterwards, he admitted the number he had in mind was lower than 45. “I think I exceeded my expectations on the goal front,” he said with a wide grin, owning one of the biggest smiles in hockey and becoming one of the better interviews too — both candid and charismatic. Twarynski was sounding a lot more confident in general in that follow-up conversation. There is some swagger in his tone these days, though not necessarily a cockiness. Twarynski isn’t the biggest name on the Rockets’ roster — overshadowed by the likes of Cal Foote, Dillon Dube and Kole Lind — but he has continuously stepped up in their absence, when they were away auditioning for Canada and playing at the World Junior Championship, when they were sidelined by injuries, and again when they were healthy scratches on the final weekend of the regular season. Twarynski wasn’t riding their coattails and served that reminder by scoring twice in the first period to pace Kelowna’s 5-2 road victory over the Vancouver Giants in the Lower Mainland on Friday before getting rewarded with a rest in sitting out Saturday’s rematch back in the Okanagan. Carsen Twarynski skates toward the Kelowna Rockets’ bench to celebrate one of his 45 goals. “I’ve worked on my shot ever since I was young, it’s probably been one of my best assets,” Twarynski said. “I just focused this year on shooting when I had the puck in good spots. I’ve got a good enough shot that even if some of them aren’t in a good position, they’re going to go in. . . . Listed at 6-foot-2 and 198 pounds, Twarynski also has a size advantage over many of his peers in the WHL. He’s physically mature for his age — almost a man among boys — and has been able to impose his will on the opposition. 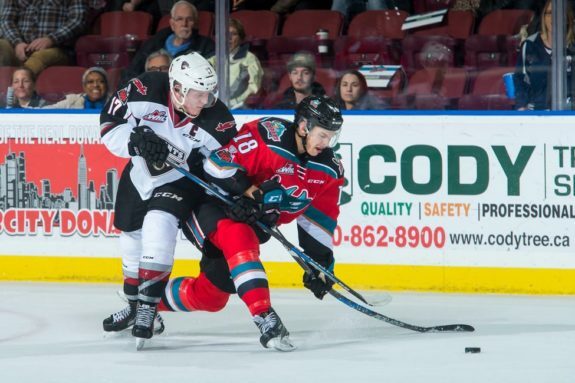 Carsen Twarynski of the Kelowna Rockets, right, battles for puck possession with Tyler Benson of the Vancouver Giants during WHL action. Benson is also a signed prospect, a second-round NHL draft pick of the Edmonton Oilers. It was evident in watching Twarynski’s presence grow over four WHL seasons. As he grew, so did his impact, his confidence and his goal total. “When you’re a big body, you can give yourself time and space to operate,” Smith said. “He’s got a real elite shot and when he’s got room and space, he can shoot the puck in the net from anywhere in the offensive zone. His willingness to get to the net this year, as opposed to last year, has really helped a lot too. Now Twarynski will take that filled-out frame to the next level, where he’ll be playing against all men next season — be it in the American Hockey League with the Lehigh Valley Phantoms, the ECHL with the Reading Royals, or perhaps even the NHL with the Flyers. In saying that, Twarynski’s speaking from experience. Carsen Twarynski has attended training camp with the Philadelphia Flyers in each of the past two years, getting into some preseason action before going back to junior. This fall, he’ll be staying in the pro ranks now that he’s signed and too old for the WHL next season. Smith sees NHL upside in Twarynski, but he’s still got a long way to go in terms of development. “For anybody that is going to move on from junior hockey, and not just him, it’s about the willingness to put the work in because it is another step up to play at the pro level,” Smith said. “And it’s about being coachable. You have to be able to take criticism and take teaching the right way, and not let it drag you down. At the next level, there’s a lot more accountability on the individual to perform and there’s expectations that you’re going to be doing things the right way. Nobody is perfect and there’s always room for improvement in one area or another. For Twarynski, that means adapting to a faster, more skilled game, with the pro ranks trending that way. “My skating is there, it can still be improved, as can anyone’s, but to be able to get my hands moving as fast as my feet when I’m skating top speed, that would be a bonus to my game,” Twarynski said. Twarynski will never be a flashy player. That’s just not his style. 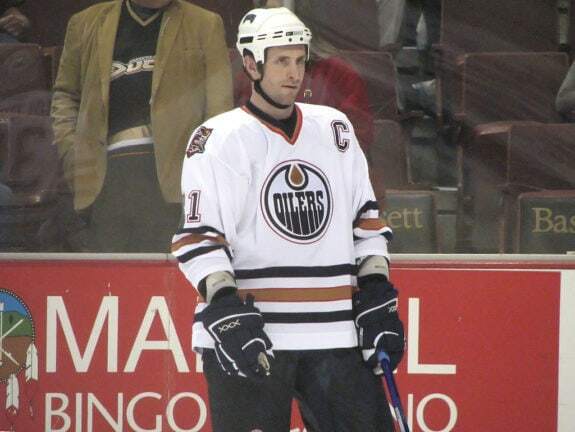 He’s a blue-collar winger, the type that is beloved in Philly from the days of the Broad Street Bullies. 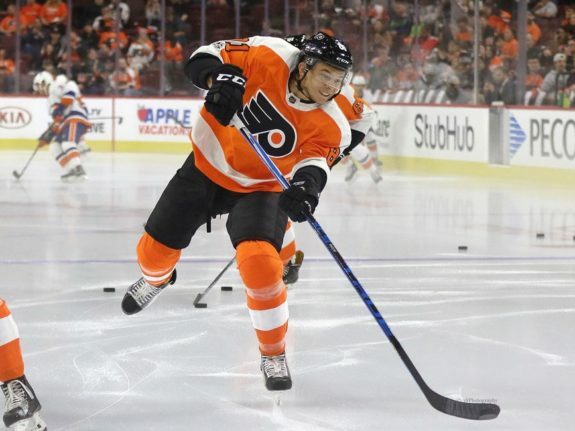 Twarynski isn’t as feisty as Tyrell Goulbourne — a former Rocket and fellow Flyers’ prospect — but he tries to model his game after Wayne Simmonds, the resident power forward in Philadelphia, who scored twice in Sunday’s 6-3 win over Washington and is gunning for his third straight 30-goal season despite missing seven games to injury. 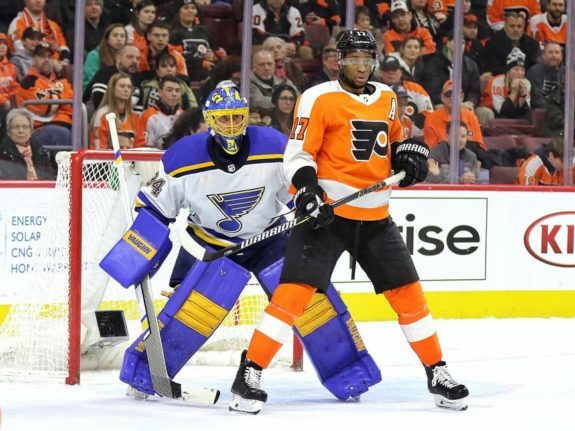 Wayne Simmonds of the Philadelphia Flyers sets up shop in front of St. Louis Blues goaltender Jake Allen. Simmonds is at 23 goals with nine games remaining in the regular season. “I’ve talked to a few management staff from Philadelphia and they have all mentioned Wayne Simmonds to me,” Twarynski said. “I take pride in that, he’s a great player, a great power forward, and he’s amazing at what he does. Not a lot of people play that kind of role nowadays, it’s a tougher role to play with how skilled the game is getting and how fast it’s getting. Twarynski wants to be in Philadelphia, sooner or later. Watching Goulbourne’s debut during his brief call-up this season — and seeing him steamroll a defender to set up a goal on one of his very first shifts — has given Twarynski hope that he may not be far off. That he could become a fan favourite there in the coming years. “Just thinking about it, if I were to get called up next year and the crowd reacting to me hitting guys and skating around being a big body, it would definitely be an exciting time,” Twarynski said. “It might not be the most fun role to play nowadays, but there’s a place for it on every team, especially in Philadelphia. That’s how they moulded their game and their team, and I think they’re going to get a good dose of it the next couple years with some young guys.